Close view of façade of Temple No. 6, Telkupi, Manbhum District. bl.uk > Online Gallery Home	> Online exhibitions	> Asia, Pacific and Africa Collections	> Close view of façade of Temple No. 6, Telkupi, Manbhum District. 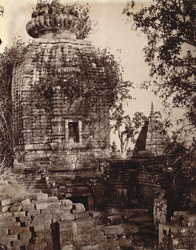 Photograph of temple No. 6, Telkupi taken by Joseph David Beglar between 1872 and 1873. This temple is one of the largest in the area and originally consisted solely of the shikara or tower that can be seen in this photograph. A large mandapa was a later addition, an assessment which is substantiated by the juncture between the two parts of the temple. The decoration to the temple was also altered as Beglar tells us: "Externally, the tower is adorned with sculpture and mouldings, carefully and finely cut in the stone itself. At some subsequent period the tower appears to have received externally a coat of plaster, in which was sculptured devices, ornaments and figures different to that in the stone below, proving clearly that the original stone tower was not covered with plaster when first built." J.D. Beglar, Report of a tour through the Bengal Provinces...in 1872-73 (A.S.I. vol. VIII, Calcutta, 1878), pp. 170-172.